THIS DRAWING IS NOW CLOSED! THANK YOU TO ALL WHO ENTERED! Happy St. Patrick’s Day! What better way to celebrate, than to launch a giveaway sweepstakes event – we ask you? 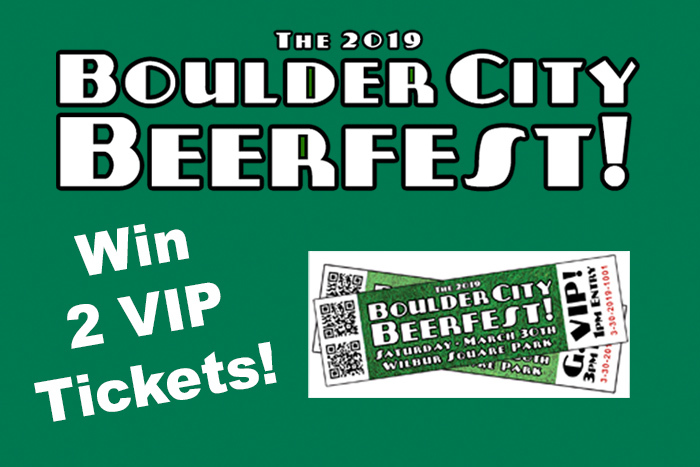 So….we reached out to our friends at Boulder Dam Brewing Company and they’re putting up 2 FREE Exclusive 1pm VIP Early Admission tickets to the 2019 Boulder City Beerfest for a lucky Boulder City Social fan! Beerfest will be held on Saturday, March 30th in Boulder City’s Wilbur Square, near the historic downtown district. Early VIP admission is at 1pm and General Admission is at 3pm (with the event wrapping up at 7pm). They have over 30 different breweries, with over 100 different pours, 8 food trucks plus other vendors and 4 different bands throughout the day. Best of all – you’re actually out having a great time – and drinking beer – for charity! Proceeds go to Operation Home Front who serve military families. You can find out more info about the event on their website by CLICKING HERE, and they have a list of social media channels at the bottom right corner of their website so you can follow them on your preferred platform. To enter to win the two free tickets, just click the button below and you’ll be taken to the signup form for the giveaway (which also signs you up for the BC Social Weekly eNews and Boulder Dam Brewing Company’s monthly eNewsletter, btw). Enter between now and midnight on Wednesday, March 27th and the winner will be notified via email on Thursday, March 28th (with 24 hours to respond or we’ll move onto a runner-up). The Fine Print: Must be over 21 years of age to enter and win. Tickets are non-transferable and have no cash value. Tickets will be held at the Boulder Dam Brewing Company for pickup and ID will be required to claim them, with no exceptions.